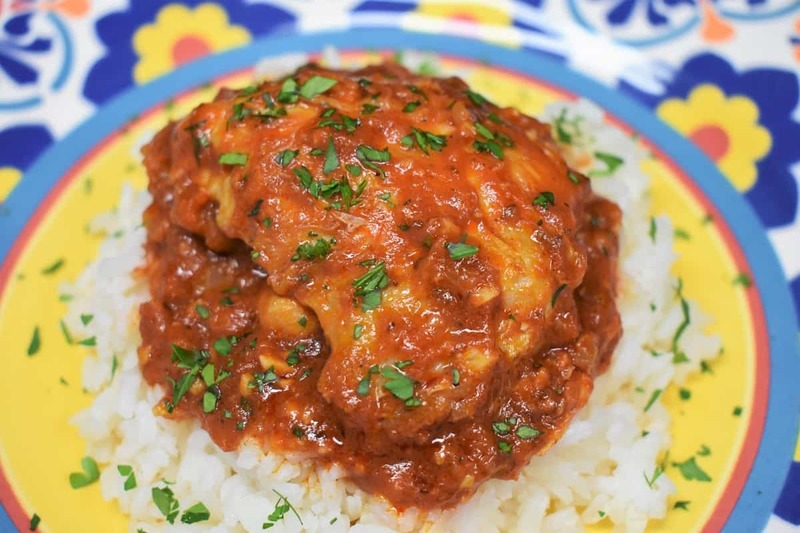 Pollo en salsa is chicken in tomato sauce with a Latin flair. 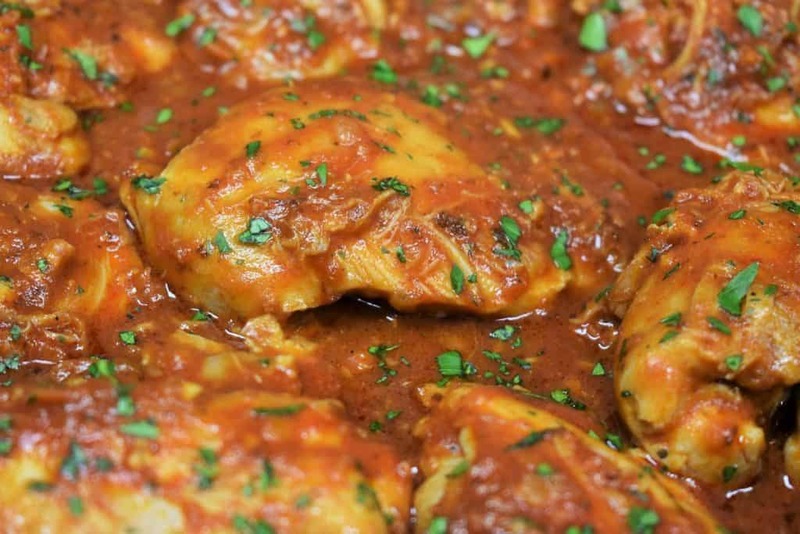 It’s similar to the Cuban classic, chicken fricassee (fricase de pollo), but less involved. This pollo en salsa recipe is easy to make. 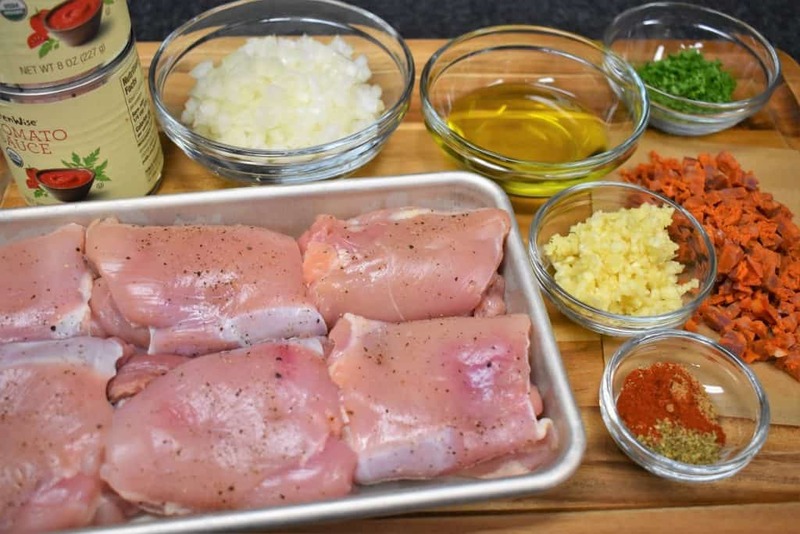 We use skinless, boneless chicken thighs because they stay juicy and flavorful, but cook up quick. The tomato sauce is seasoned with herbs and spices and gets an extra flavor kick from chorizo. 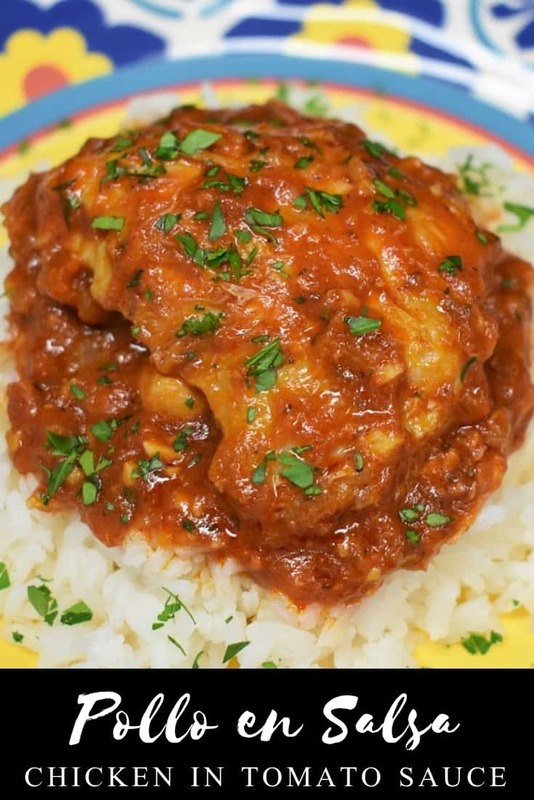 Serve this pollo en salsa over white rice for a quick, delicious dinner. 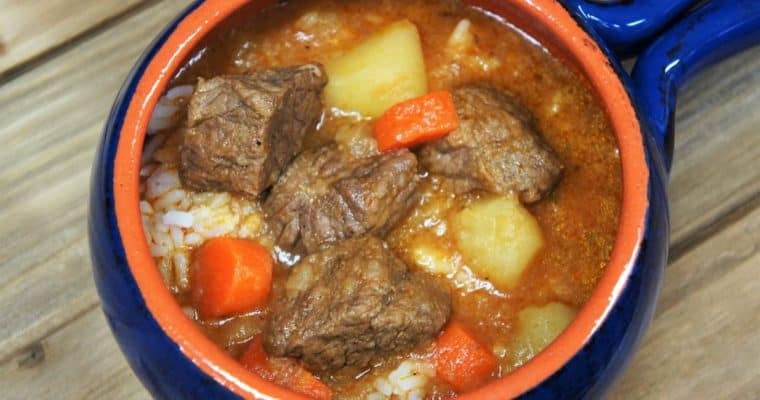 For more delicious Cuban recipes try these: Camarones enchilados – shrimp in a spicy tomato sauce, Bistec en cazuela – thin steaks cooked in tomato sauce with onions and spices, Bistec de palomilla – thin sirloin steak that’s quickly fried, a true Cuban classic, or this Sopa de res – a hearty beef soup that is sure to please. Enjoy! The tomato sauce in this dish gets a ton of flavor from Spanish chorizo. 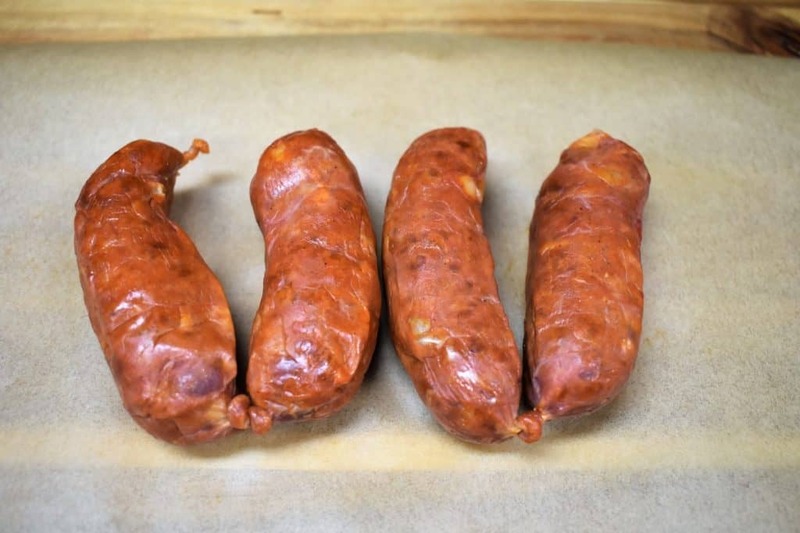 If you’re not familiar with chorizo, it’s a smoked, cured pork sausage. 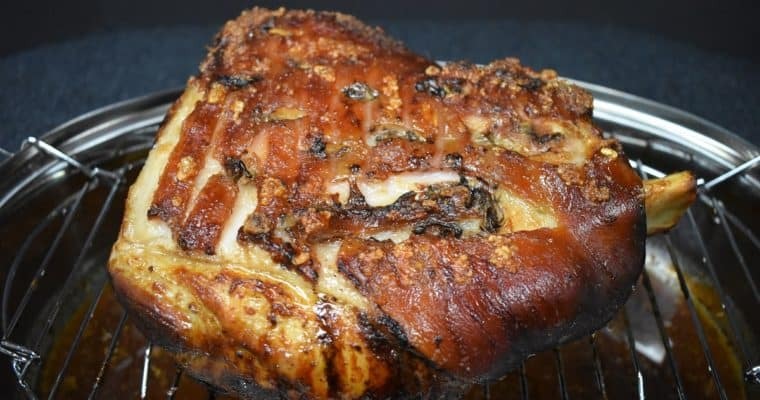 The pork is combined with a variety of spices, most notably, smoked paprika. It comes in a casing and usually linked. Spanish chorizo can be eaten without cooking, just slice it up and enjoy. It can also be added to sauces, like we do here, and soups to impart a delicious, unique flavor. Look for chorizo near the meat section at the supermarket, but not in a refrigerated case. They’re usually shrink-wrapped in plastic. Check the international food section, or your local Latin market. Or you can order chorizo. Things move quickly in this chicken recipe, so there’s no time to stop, and prep. It’s best to have everything diced, sliced, measured out and ready to go before you start cooking. This pre-cooking technique is called a mise en place, which means everything in its place. It’s an important step for stress-free cooking and one that I use all the time. 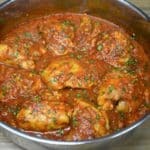 Remove any fat from the boneless, skinless chicken thighs. Season the chicken on both sides with the salt and pepper. Remove the casing from the chorizo link and cut it into small pieces. Cut the chorizo in half lengthwise and into thin strips. Then chop it into small pieces. Finish off by dicing the onions, mincing the garlic, chopping the parsley and measuring out the spices. Heat the olive oil in a large, deep skillet over medium heat. When the oil is hot, add the chicken thighs. Cook the chicken for 5 minutes. Flip it using a spatula and cook for another 5 minutes. It’s possible the chicken will stick a little and some chicken bits will remain on the bottom of the pan. That’s OK. Those little bits will flavor this sauce beautifully. Take the skillet off the heat; remove the chicken thighs from the skillet and place them on a plate or pan. Don’t worry that the chicken is not cooked all the way through. It will finish cooking in the sauce. Keep the chicken warm by covering it loosely with a piece of foil. You can also keep it in the microwave or oven, it will stay nice and warm away from drafts. Do not wash the skillet. Place it back over medium heat and add the onions. Cook the onions for 2 minutes, stirring frequently. Next, add the garlic, chorizo, paprika, oregano and cumin. Cook for 30 seconds to 1 minute while stirring. Now add the tomato sauce and the water to the skillet while stirring and gently scraping the bits off the bottom of the pan. Here’s a little tip, I like adding the water to the empty can of tomato sauce and giving it a swirl. That way I get every last drop! Add the chicken thighs back to the skillet, along with any juices collected on the plate. Once the sauce starts to simmer, lower the heat to medium-low and cover. Keep the sauce at a simmer, if it’s boiling too vigorously, lower the heat a bit. Cook the chicken for 20 minutes or so, stirring occasionally and turning the chicken. Make sure the internal temperature of the largest piece of chicken is at least 165°F at the thickest part. Taste the sauce just in case it needs a little bit of salt. We go really easy on the salt in this recipe since the tomato sauce and chorizo both contain a good amount. As a reference, we didn’t need to add any extra, but salt is always a matter of taste. Garnish the pollo en salsa with parsley, serve over white rice and enjoy. Pollo en salsa is chicken in tomato sauce with a Latin flair. 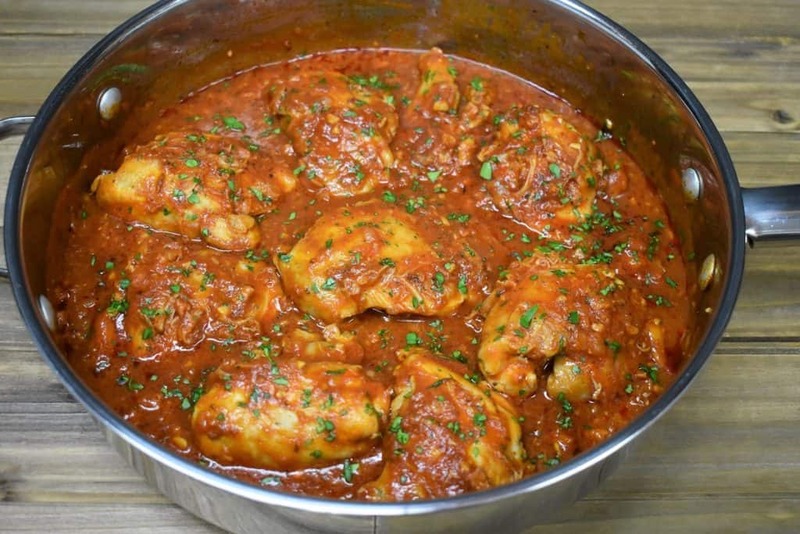 It’s similar to the Cuban classic, chicken fricassee (fricase de pollo), but less involved. Add the chicken thighs. Cook for 5 minutes. Flip the chicken using a spatula and cook for another 5 minutes. It’s possible the chicken will stick a little and some chicken bits will remain on the bottom of the pan. Those little bits will flavor the sauce. Take the skillet off the heat; remove the chicken thighs from the skillet and place them on a plate or pan. Keep the chicken warm by covering it loosely with a piece of foil. You can also keep it in the microwave or oven, it will stay warm away from drafts. Do not wash the skillet. Place it back over medium heat, add the onions and cook for 2 minutes, stirring frequently. Add the garlic, chorizo, paprika, oregano and cumin. Cook for 30 seconds to 1 minute while stirring. Add the tomato sauce and the water to the skillet while stirring and gently scraping the bits off the bottom of the pan. Add the chicken thighs back to the skillet, along with any juices collected on the plate. Once the sauce starts to simmer, lower the heat to medium-low and cover. Keep the sauce at a simmer, if it’s boiling too vigorously, lower the heat a bit. Cook the chicken for 20 minutes or so, stirring occasionally and turning the chicken. Make sure the internal temperature of the largest piece of chicken is at least 165°F at the thickest part. Taste the sauce just in case it needs salt. Garnish the pollo en salsa with parsley and serve over white rice, if desired. We go really easy on the salt in this recipe since the tomato sauce and chorizo both contain a good amount. As a reference, we didn’t need to add any extra, but salt is always a matter of taste. The chorizo adds a nice touch.